In this day and age, homes have to have good surveillance systems in place to help protect things such as investments, properties, belongings, and most importantly, family members. Homes can’t be monitored round the clock as there will always be times when nobody is left at home. That’s where the video security system comes in. If you need a very light duty basic starter set with easy installation and the ability to get up and started without much hassle then look no further. Since this is not a WIFI system you will have to run cable, but almost everything that you need is included in the box, unlike other systems that leave out the cables, connections etc. The system comes with everything except for the hard drive which you will need to purchase separately. With great options like pre-alarm recording that send alerts to a designated email, 720P HD recording weatherproof cameras, and high-intensity LEDs for night vision, you can’t go wrong with the XVIM Camera System if you are in the market for pretty decent security camera system. 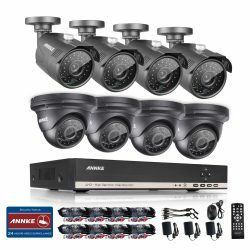 The Annke 8 channel security system is a fairly simple entry level home/business surveillance system for anyone to work with. Annke brings a lot of value once the system is fully set up. The system comes with a (1080N) DVR and 8 960P 1.3MP Security Cameras that give you crystal clear images at 720P HD resolution. The DVR is not just a DVR, it is also three in one, DVR/HVR/NVR that allows you to get HD quality video under whatever mode. It also comes with multiple ports for connecting a monitor including an HDMI port, so that you can watch live video in 1080P clarity. Remote viewing is a snap because Annke uses a QR code for you to scan for instant remote access via any mobile device. 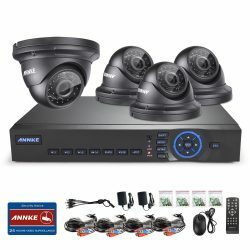 Overall the Annke 8CH system is a great little system for both home and office use at a very decent price. 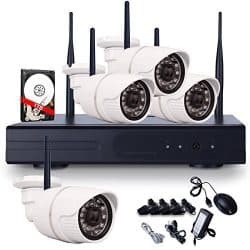 The Zmodo 8CH 960H DVR with 700TVL cameras security system is an ideal system for any home or business even if it’s your first security camera system you’re considering to purchase. The system comes with 8 700TVL High-Resolution Security Cameras that are both weather-proof and night vision capable as well. The DVR is simple to set up and unlike many other systems, this one comes with a 1TB Hard Drive already installed. If you are worried about running out of space on your hard drive, the system provided smart recording – in order to help maximize the hard drive storage of your unit. One of it’s neatest features is its easy setup QR Code for you to scan with any mobile device in order to to start viewing remotely anywhere and anytime. This is also provided through the Zmodo App as well. Push Alerts via text messages or e-mail are automatically and instantly provided by the system when motion is detected within the camera’s range. Overall, we highly recommend this system to anyone who is looking for a system that doesn’t break the bank and just flat out works. Intelligent Recording:When motion detected,it records real-time @25fps, displaying detailed image. If no motion, it records non-realtime @5ftps, and saves storage a lot. Annke is making a statement with each camera system they produce and this particular model is no different. The all-in-one HD System delivers crisp 1280x720p (1280tvl) resolution real-time images unequaled by other platforms on the private consumer market today. Just like their 8 channel system the advanced HD HVR System works as a DVR, an HVR, and an NVR. You can get HD quality video under whatever mode you choose. The system uses the QR-Code Scan technology to quickly give you remote access to the system. Remote viewing can be done on both your PC and mobile devices. The Annke systems transmissions are well encrypted and run on your network by using the DVR as a central hub. The system comes with 4 weatherproof dome cameras that deliver impressive 1280×720 High Definition video. They also provide night vision video of up to 100 feet with the 24 LEDs each camera comes with which is a pretty good range compared to the majority of security cameras on the market today. All Annke systems are CE & FCC certified and come with qualified power supplies. The system comes with a full year & free lifetime Tech Support which makes this system an even better deal, not counting the awesome price tag it comes with. Anran is a fairly new player in the surveillance security market with an extensive lineup of products to offer to consumers. Many today are choosing to go wireless with their security camera systems and Anran has provided just that for the consumer. This all-in-one 4 Channel WIFI NVR System. comes with no complexity to setup compared to traditional WIFI systems. Just power on the cameras and the NVR, and you will instantly be able to view live video on your TV or monitor. The system comes with 4 WIFI cameras. They are fully weather-proof and produce up to 1280×720 High-Resolution video. They come with 24 built-in LCDs that illuminate up to 45 feet to help produce video at night time. Not too impressive compared to some cameras on the market today that can produce up to 165 feet of illumination with their built-in LCDs. You can say goodbye to messing around with data cables because the cameras connect to the NVR (DVR) wirelessly and effortlessly. This of course, does not mean that the cameras are totally cable-less. You still have to connect them to the provided power adapters for supplying power to the cameras and to the NVR. The NVR comes with a pre-installed 1TB hard drive to store your recorded videos. The camera can store up to 720P HD videos, but you can scale the system to store lesser quality videos in order to save space on the hard drive. Overall the Anran system is a great system especially for those considering to purchase their first WIFI security camera system. 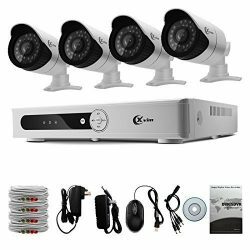 All of these systems are great systems for any homeowner to start out with or for upgrades from their previous security camera systems. They all have their pros and cons, but if we had to choose one out of the 5 we would recommend the Zmodo 8CH HDMI Security Camera System. 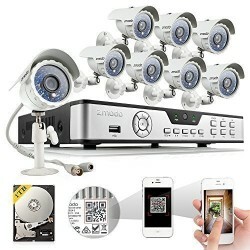 Zmodo is a proven name that consumers trust and because the system comes packed with great features and 8 high-resolution cameras for the low price that the system retails for, you really can’t go wrong here. For more information on home video surveillance systems reviews and other info click here.